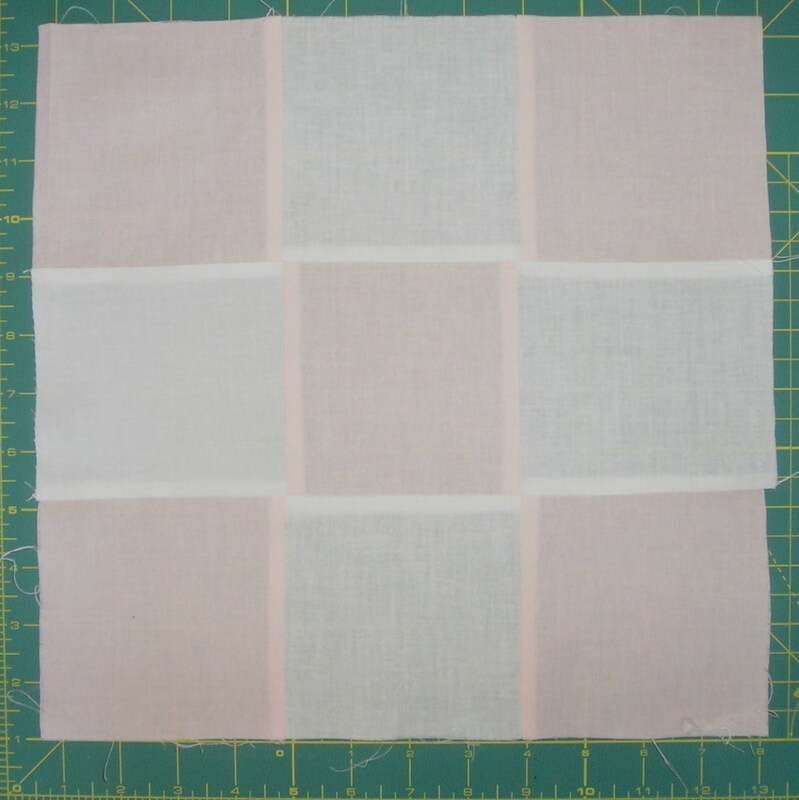 The humble nine-patch is an essential quilt block. If this isn't your first block, it should be. Like the name implies, it features nine patchwork squares arranged in a three-by-three grid, just let a chess board or tic-tac-toe square. It's easy to make, it's easy to get great results, and it can be used in a variety of ways. I'll show you the basics, plus methods for speeding up the process while making perfect nine-patch blocks that you can turn into beautiful quilt. Let's get started! A rotary cutter with surgical steel blades and a self-healing cutting mat. Buy it as a kit or go a la carte. Star thread by Coats and Clark is my favorite for piecing and quilting, It's 100 percent Egyptian cotton. Stay neutrals or pick a color to match your project. Did I mention it comes on huge spools? The most obvious way to assemble a nine-patch block is to lay out nine individual squares. You would stitch together three squares to make a row, and then stitch three rows together to create one block, but that's not the fastest way. Free-motion quilting instructor Angela Walters always recalls her husband's grandfather showing her how to quilt, cutting out all nine squares and stitching them together one by one. When she finished her first block, he said, "Now, let me show you the easy way" and whipped out the rotary cutter. I just love that story because it truly pays to learn something the slower or more difficult way. Then, the proven method seems even easier. I still lay out all nine squares separately when piecing together five-inch charm pack squares to make a 14-inch pillow cover or another project using pre-cut fabric. However, when I'm making nine-patch blocks for a quilt, I use the speedy strip piecing method. 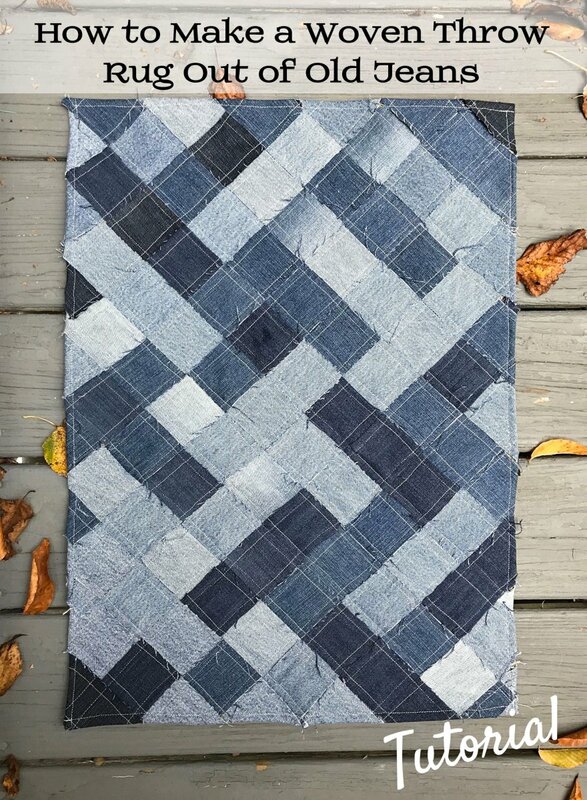 Strip piecing is a quilting fundamental, and the nine-patch is a great way to discover and master this technique. 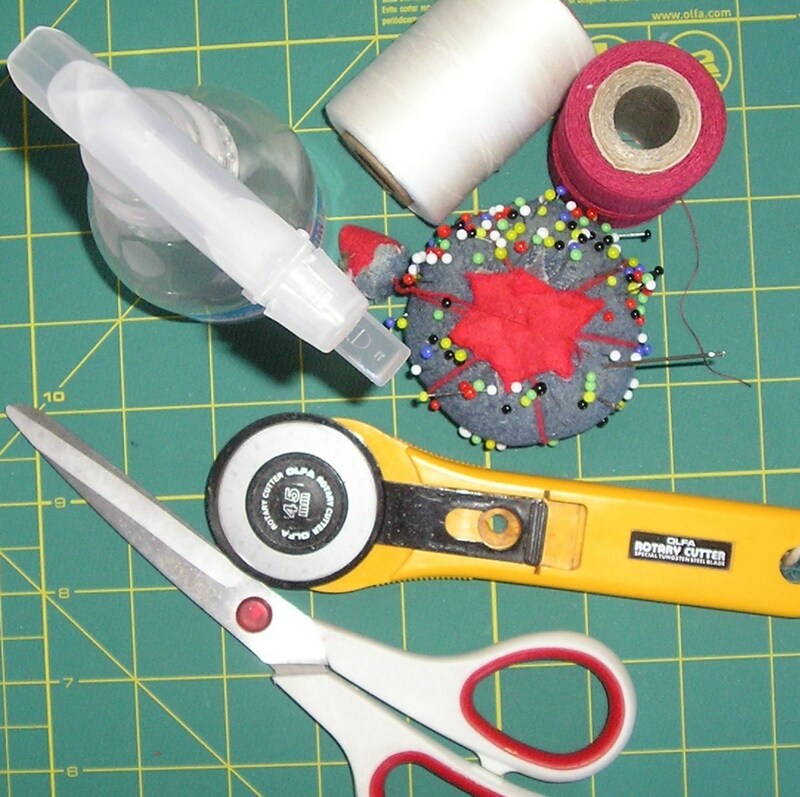 Before you whip out your fabric and cutting tools, let's cover the basics. 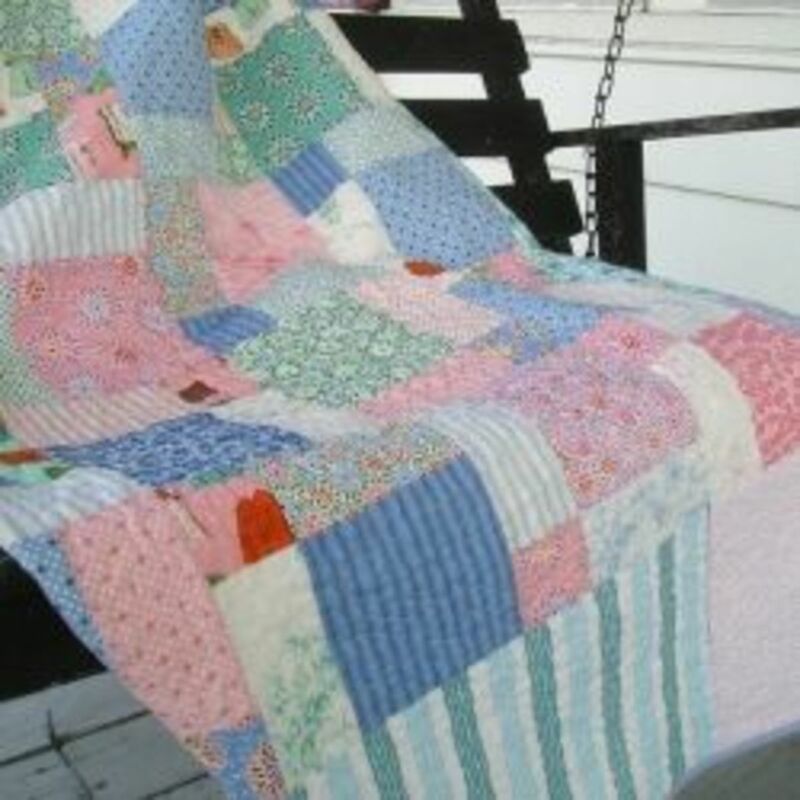 Since this tutorial is intended for beginners and first-time quilters, I'll assume that you don't know what I'm talking about when I mention flying geese, speed piecing, strip piecing, half-square triangles and all kinds of quilter jargon. That's okay because I didn't get these terms either, and no one was born knowing how to quilt. Here's my motto: If you can sew, you're halfway to quilting. 1. Unless I'm using fat quarters, charm squares, jelly rolls or other pre-cut fabrics, I always wash and pre-shrink my fabric. This is my preference. I definitely wash and shrink solid broadcloth, because shrinkage rates vary—and you know how a quilt with variable shrinkage will look. If you're a fashion sewist, you probably remember the wash and dry it twice method. There's nothing wrong with that, but it seems wasteful to me. I've found that a single wash is fine as long as you use the longest dryer setting. The reasoning is that maximum shrinkage occurs when the last bits of moisture are removed. If necessary, open up the dryer and untangle your fabric to make sure that it is thoroughly dry. 2. Starch is your friend. Starch and iron your fabric before cutting to minimize distortion. 3. Always use a 1/4-inch seam allowance. Quilting is different than fashion sewing where you're used to 5/8th seams. 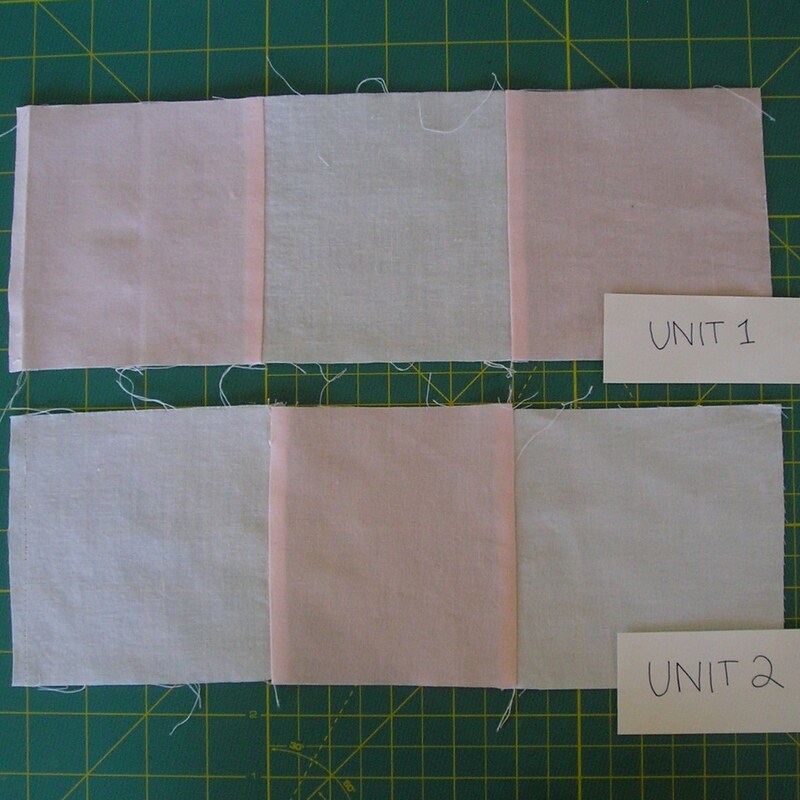 Most quilting techniques are designed to minimize excess bulk. Check and double-check your seam allowance to make sure it's really 1/4-inch. If you have a computerized sewing machine, use the stitch width selector to move the needle position, so you can use the edge of your presser foot as the seam guide. For my machine, I adjust the needle position to 4.5 mm. The seam allowance is super important to ensure that your blocks are the right size. If you can't get a true 1/4-inch seam, just be consistent. 4. 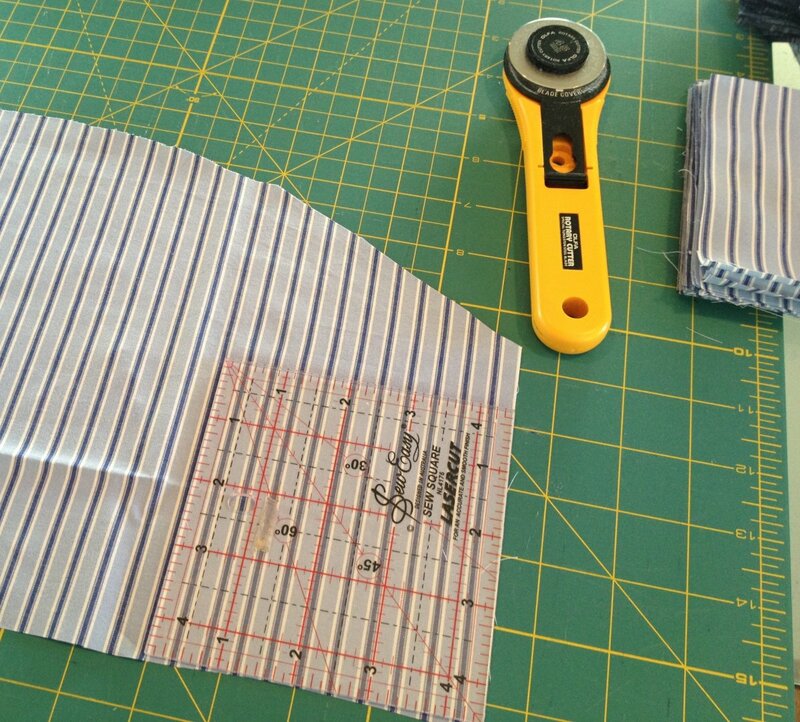 Before you press seams open, iron the strips while they are flat. 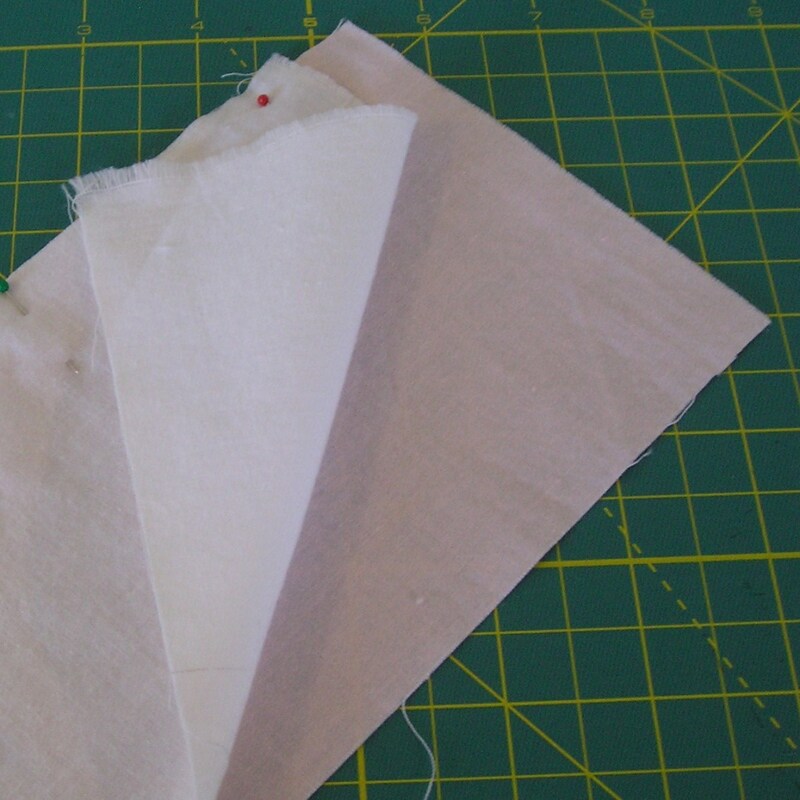 This fashion sewing tip helps set the seam before you press the strips open. Use starch to make the process easier. 5. Press all seam allowances toward the darker fabric. If you don't, darker threads might peek through—no one wants that! That's all of the basic rules that I can think of for now. If you can sew, you're halfway to quilting! 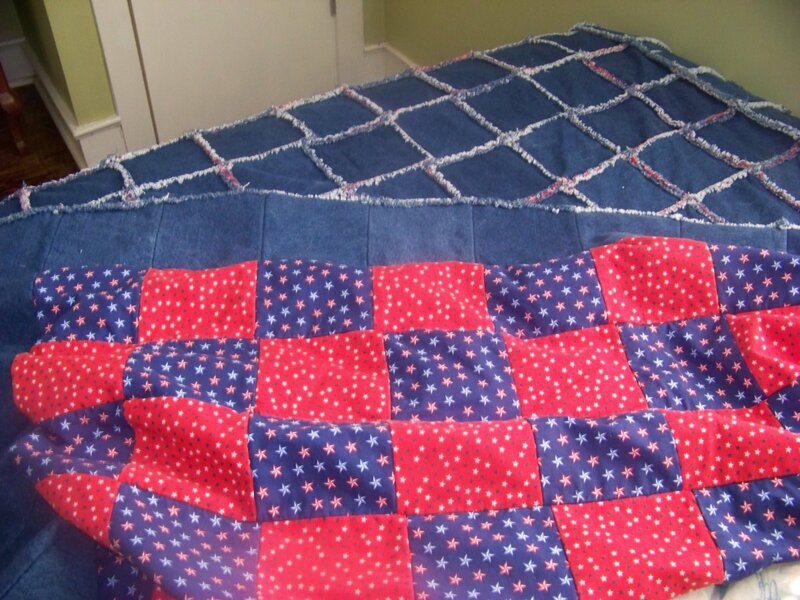 This tutorial will show you how to make 12-inch quilt blocks using the nine-patch pattern. 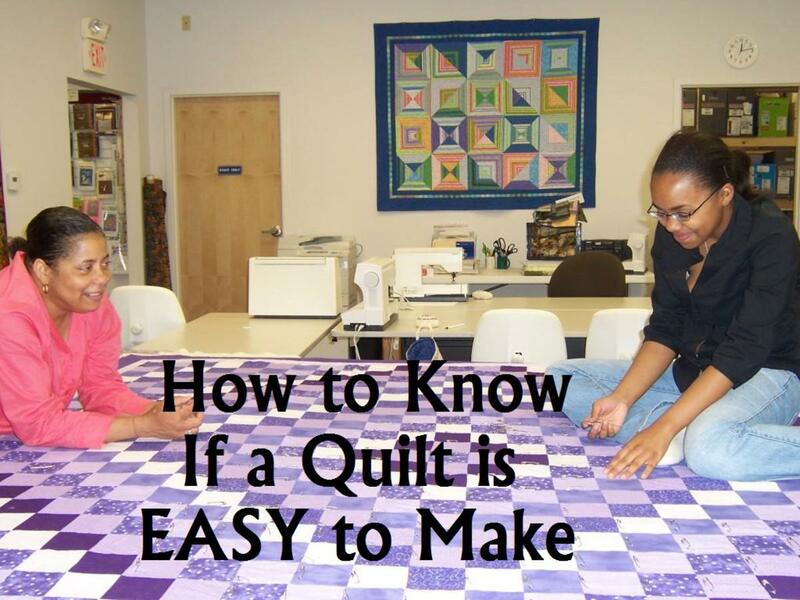 In quilting, 12-inch blocks are fairly standard because the measurements are easy to work with. The measurements refer to the finished size, after the 1/4-inch seams have been eaten up on each side. Therefore, a 12-inch block would measure 12.5 inches square when it stands alone. 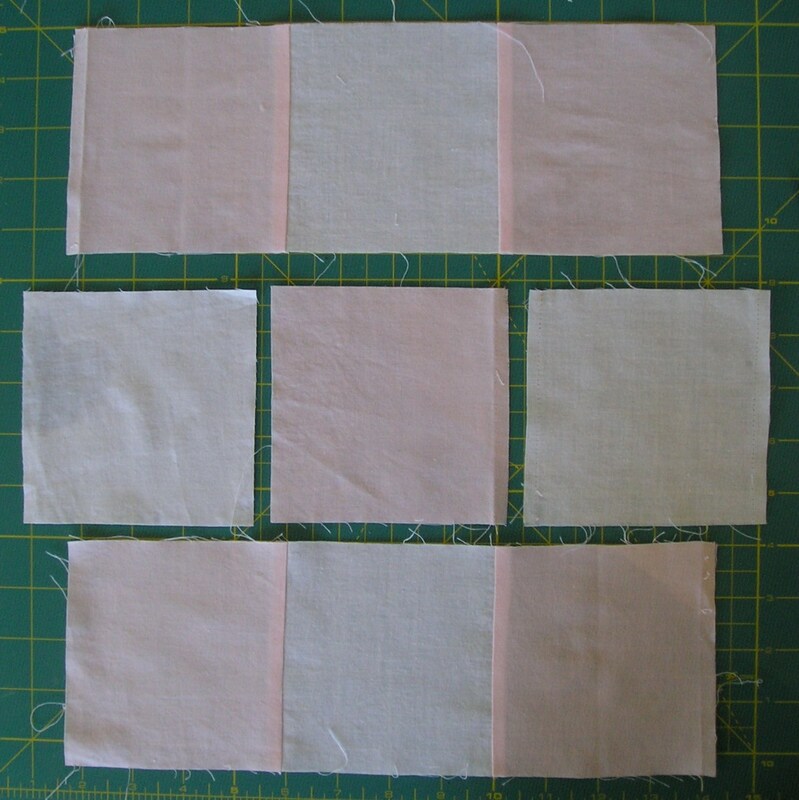 Since a nine-patch is made from three squares on each side (three times three equals nine), each square or strip should be 4.5 inches. 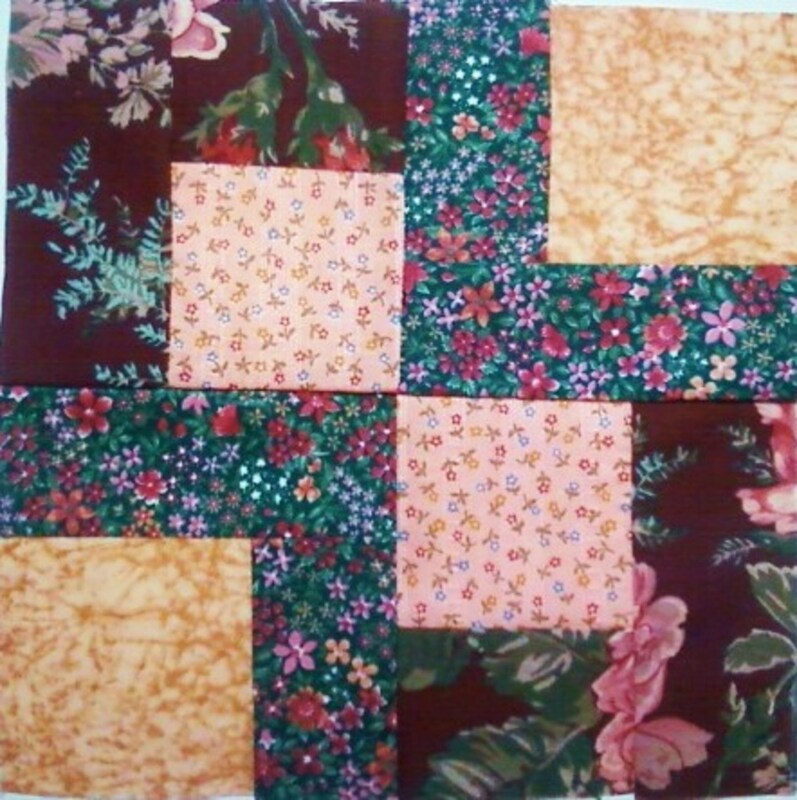 After the seams are used up, three four-inch squares equal 12 inches. If you'd rather make 9-inch blocks, start with 3.5-inch strips instead. For this tutorial, we'll be using strip piecing to make lots of blocks quickly. As you may have noticed, each nine-patch block has three rows that are made from two units only. Unit 1 appears two times--on the top and on the bottom. Unit 2 is in the middle. Unit 2 features two light value squares separated by one dark value square. Strip piecing allows you to create pre-assembled rows. One series of strips can be sliced into pieces that represent Unit 1. The other series will be Unit 2. NOTE: You'll need half as many light squares, because the ratio of Unit 1 to Unit 2 is 2:1. For Unit 1, you'll need to dark value strips and one light strip. For Unit 2, you'll need two light value strips with one dark value strip in the middle. To create your strips, fold your fabric in half with the selvages together, and cut your first strip, making sure that it's 4.5 inches wide. Continue cutting 4.5-inch strips from both dark and light fabrics. Once you have three strips in each color, you can begin assembly. For Unit 1, two dark strips are on the outside, one light strip is on the inside. For Unit 2, two light strips are on the outside and one dark strip is in the middle. 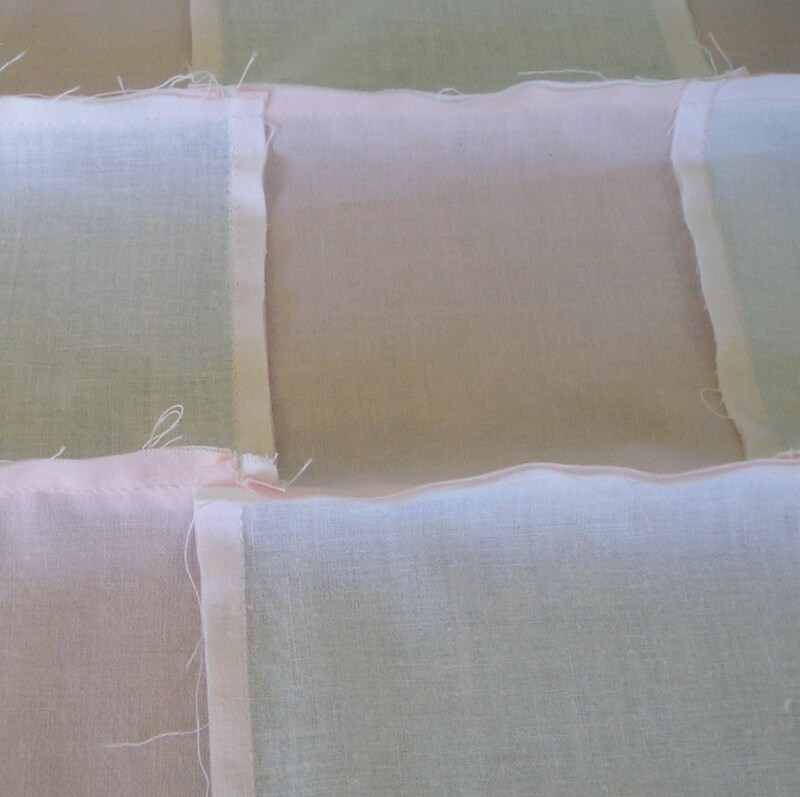 Each group of three strips will have two seams. 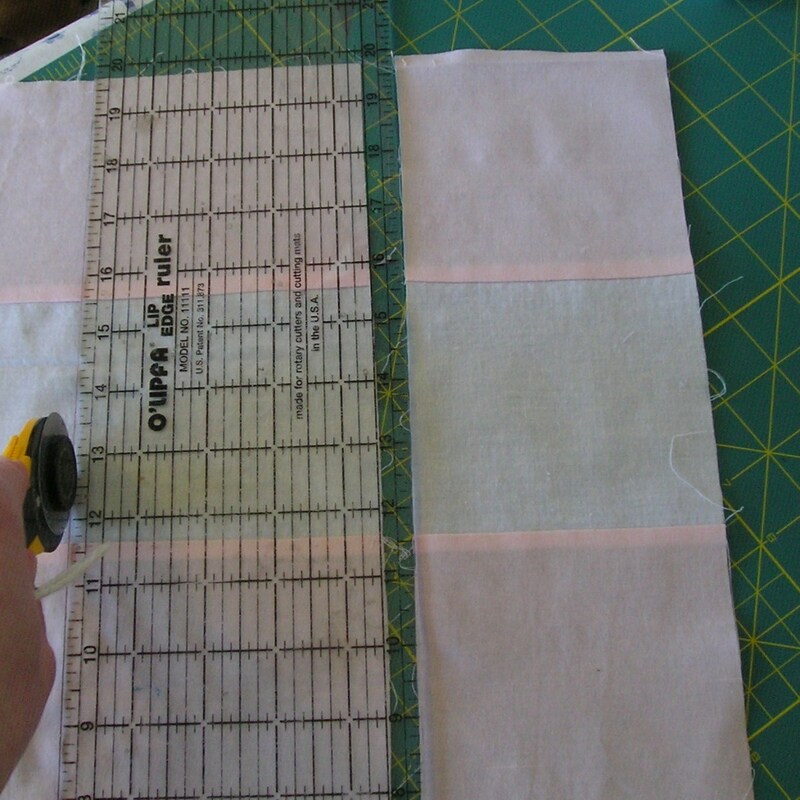 Pin the strips together, and stitch from top to bottom using a 1/4-inch seam. This is my absolute favorite ruler. It has 1/4 lines, 1/8 hash marks, 45-degree and 60-degree angles, and my favorite feature the O'Lipfa lip that wraps around the edge of your cutting mat for extra stability. Now comes the interesting part. Once you have your three-strip groups assembled. Press the seams with the seam allowance going toward the dark strips. Repeat the process for both groups. Now, cut off the uneven edges, making sure that the cut is perpendicular with the long edge. Next, cut your first row of 4.5-inch strips. Repeat the process until you reach the end of the multi-strip group. Cut the other using the same method. Each slice represents one row of the nine-patch block. Once you've cut your multi-strip groups into Units 1 and 2, it's time to join them together. Take two Unit 1s and one Unit 2. Line up the squares so that the seams press up against each other--this makes the block stronger and helps the seam allowances lay flat, which minimizes bulk. Because you've pressed the seam allowance toward the darker squares, one seam allowance will go one way and the other will go in the opposite direction. Place a pin so it goes through both seam allowances, and continue pinning until you reach the edge. Repeat the process on both seam allowances on that row. Join row three following the same steps. Then, take your block to the machine. Back tack, and stitch across the block using your 1/4-inch seam allowance. Back tack at the end, and cut your threads. Stitch the seam between rows two and three following the same method. Now, you're almost done. The last step is to press the new seam allowance flat and open the four intersections where the blocks meet. 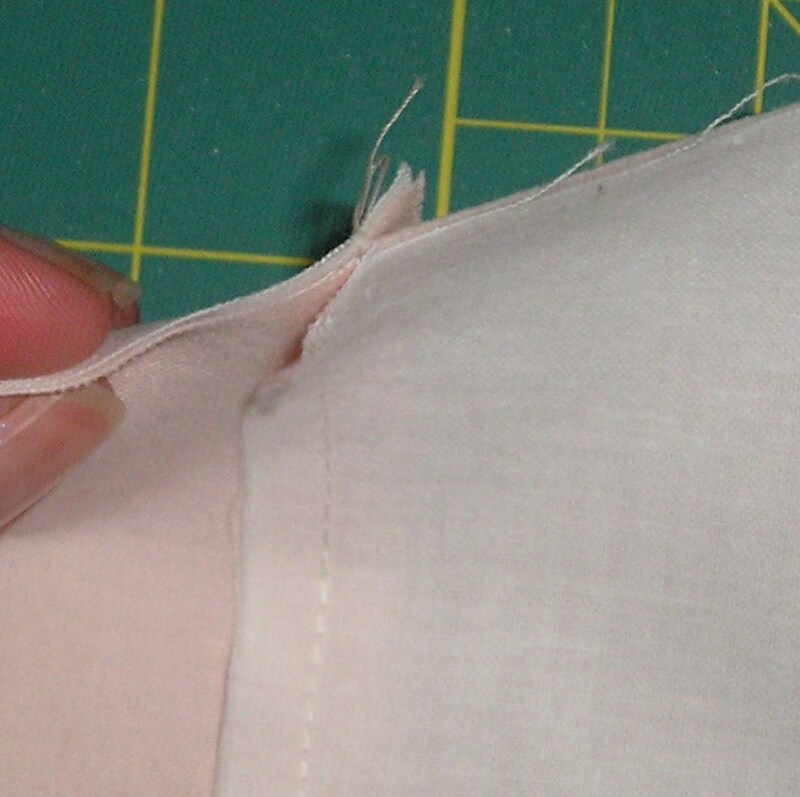 To do that, gently tug the four-way seam open and press, so that the seams lay flat. This time the seam allowances will go toward the lighter squares. 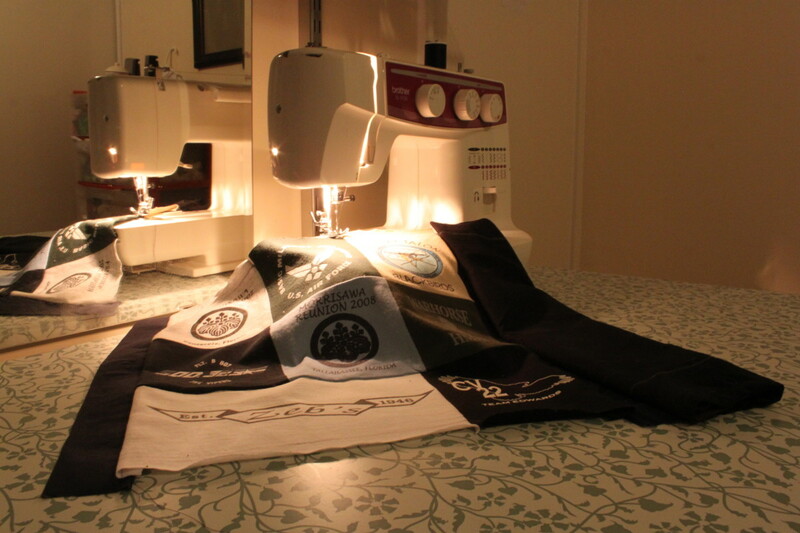 If you're working with a dark fabric that's likely to show through, press the seams open. Yay! You're done. You've finished your first quilt block! Final step: Run around the house showing anyone who'll listen! Obscure computer screen with nine-patch block if necessary to get their full attention! Ta-da! If you'd like to create the primary jumble quilt pictured at the top of this page, you can download my pattern here. Nine-Patch Quilt Projects — Take the Next Step. 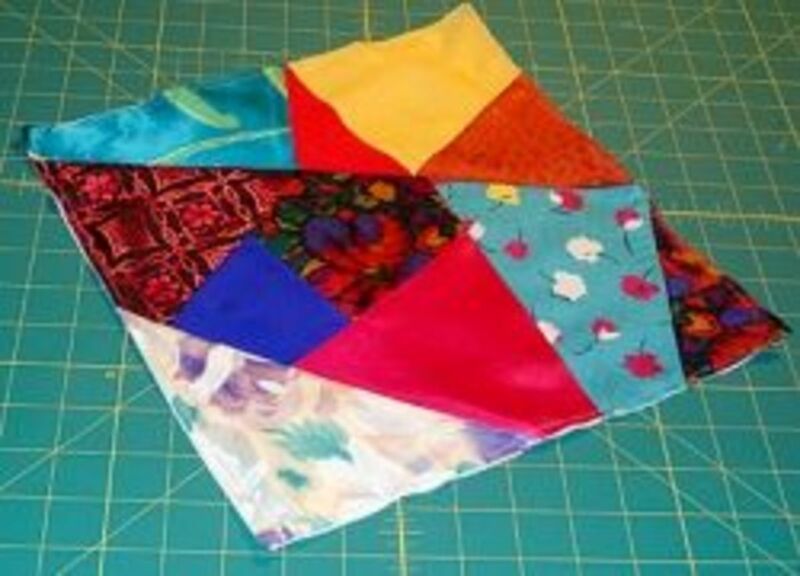 Turn Your Blocks Into a Quilt. Your finished nine-patch block should look like this. 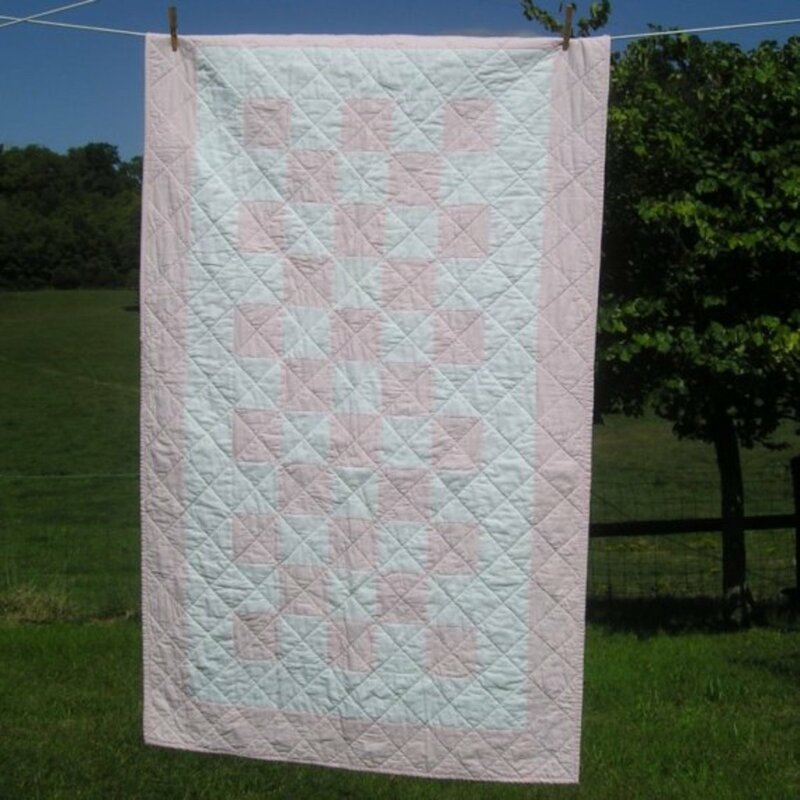 Use your strip piecing skills to create a classic baby quilt. 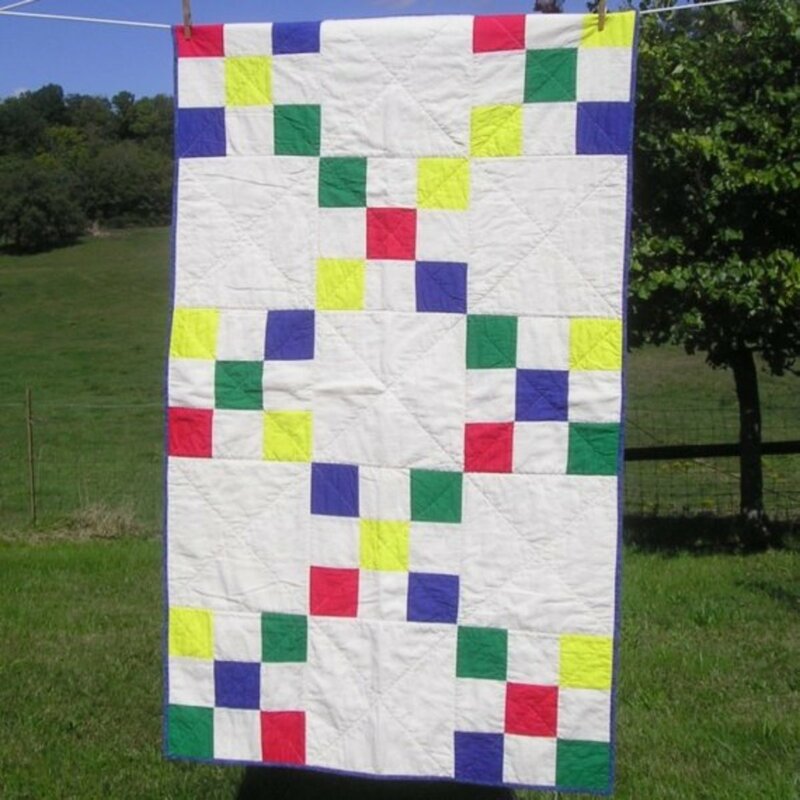 Turn your nine-patch blocks into a simplified Irish chain quilt. Just alternate nine-patch blocks with solid setting blocks cut to the same size. How's your nine-patch block coming along? Is it working out for you? Do you have any questions? Share your comments, questions and projects here. What Are Your Quilting Plans?